Not very much, I’m afraid. Some friends will drop in. Soha is coming.The other children Sabaa and Saif will also come if they can. Let’s see. Yes, it certainly adds to my happiness , obviously. I do see them as much as I can. But not enough because we live in different cities. But I must say they re-energize me. There’s nothing like young children’s energy …They are always curious, and enthusiastic about many different things. So yes, being around Taimur and Inaaya makes me really happy. Though like I said, I wish I could be with them more often. I don’t think I was pregnant during Aradhana. But yes, during Safar and Choti Bahu I was pregnant and quite unwell in the last phase of my pregnancy. Then during Besharam I was pregnant with Sabaa. You now have more time for your grandchildren than you ever did for your children? Yes that’s true. I do have lots more time for my grandchildren,the kind of pressures on time that I tackled earlier are no more there though I do keep myself busy with professional commitments like the random ad here and a cinema conference there. But definitely I now have more time for not just my grandchildren but also my children. I have more time for our ancestral home in Pataudi also. Well, it will depend on who the captains of the ship are , the producers and director. It is a good story, I think, with all the twists and the turns in his life….father’s death, losing his eye after which his average came down from 60 to 30. To receive such a blow at such a young age….I don’t think anyone else has been able to make those adjustments and that kind of an impact with one eye. He not only batted but also fielded after the eye accident. I think he was a wonderful sportsperson. God knows, what he’d have achieved if he had both his eyes. That’s because he had a wonderful temperament. He absorbed that loss and moved ahead. Tiger’s life was filled with losses, his father, his eye, his privy purse…In her book Soha has written so well about her father. (laughs) I don’t know about that. But I learnt so much from him. I do miss him immensely. I wish he was here for me. So many of my friends are still together with their soulmates. You see your friends celebrating their 50th wedding anniversary…But it was not meant to be (for me). So what can I do? No, let them (the filmmakers) decide. Maybe Saif can be in one phase of the story. His story has so many phases. Even a good documentary is a good idea. Unfortunately there isn’t too much footage on Tiger available. Sharmilaji there is a lot of talk about women’s safety going on in our society. What made you so strong, independent and non-vulnerable in your heydays? Probably my family background. We’ve always had very strong women in my family. Also , I had the self confidence. I wasn’t career-oriented. I liked the work and I enjoyed it. But I had other interests. I had a strong sense of self derived from my family, and perhaps that kept me from harm’s way. Also, I had a very protective hairdresser Neena who always checked my behaviour. She was always saying, ‘Why are you doing this…Why are talking so loudly?’ etc. Neena was my constant companion at outdoor shootings. She also gave me a lot of objective perspective. I don’t want to comment on it. I don’t see how my two-bits can contribute to the discussion. I followed a bit of it… But I don’t know… Of course I’ve always supported the feminist movement . But this naming and shaming …I really don’t know. (interrupts) Without talking about Sara? Yes, I am so excited about her debut (in the film Kedarnath). I am very impressed by her… though I don’t see why her self confidence should surprise me. But whether it was Koffee With Karan, Rajeev Masand, BBC…her confidence, humility and charm made me so happy ….it’s so heartwarming to see her the way she has turned out. When asked what she’s doing in films after going to Columbia University she said the education was for her growth as a person and not for career. She’s never tongue-tied. And how well she stood up for her father on Karan Johar’s show. I am really proud of her. 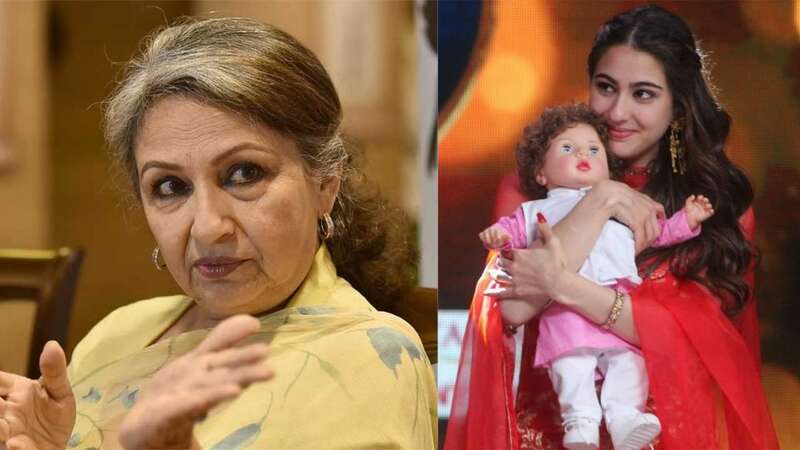 Finally Sharmilaji, your grandson…the biggest Khan superstar Taimur? (laughs) I must confess I’m worried about him a bit. We in this family have all had our share of media attention. They place you on a pedestal and then suddenly drop you. At the moment Taimur is not affected because he’s too young to understand what’s going on. But later when he’s older and if the attention is taken away he might get affected. So we are a little concerned . But as Sara said, what can we do about it?Frankly without the media we are not alive in today’s day and age. (laughs) He’s innocent and he’s young…Let’s hope he won’t be adversely affected. I’d like to request the media to be a bit more sensitive to him. Otherwise what can we do?